Memory foam side sleeping pillow, best pillow for side sleepers, proprietary pressure relieving formulation of visco-elastic material relieves pressure as your head settles into the patented design facial cradle. Guaranteed to be made of the highest quality memory foam available, with a 5-year limited warranty. OBS has determined this memory foam side sleeping pillow to be one of the most supportive pillows available for side sleepers. One size DOES NOT fit all. Only buy from an authorized online retailer that can help you determine the size that will work best for you. STANDARD PILLOW Sizes (24” x 12” x 3”) for 5’ 4” and shorter, (24” x 12” x 4”) for 5’ 5” and taller, (24” x 12” x 5”) for 5’ 10” and taller with broad shoulders. 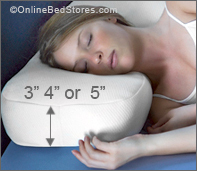 TRAVEL PILLOW Sizes (16” x 12” x 3”) for 5’ 4” and shorter, (16” x 12” x 4”) for 5’ 5” and taller. 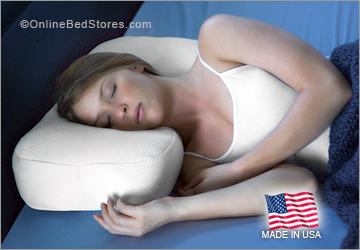 Side Sleeper Pillow Made in the USA, 5 Year Replacement Warranty, Three Heights 3″ 4″ and 5″.